O God, whose blessed Son became poor that we through his poverty might be rich: Deliver us, we pray thee, from an inordinate love of this world, that inspired by the devotion of thy servant Sergius of Moscow, we may serve thee with singleness of heart, and attain to the riches of the age to come; through the same Jesus Christ our Lord, who liveth and reigneth with thee and the Holy Spirit, one God, now and for ever. O God, whose blessed Son became poor that we through his poverty might be rich: Deliver us from an inordinate love of this world, that we, inspired by the devotion of your servant Sergius of Moscow, may serve you with singleness of heart, and attain to the riches of the age to come; through Jesus Christ our Lord, who lives and reigns with you and the Holy Spirit, one God, for ever and ever. To the people of Russia, Sergius is a national hero and an example of Russian spiritual life at its best. Sergius was born around 1314, the son of a farmer. When he was twenty, he and his brother began to live as hermits in a forest near Moscow. Others joined them in what became the Monastery of the Holy Trinity, a center for the renewal of Russian Christianity. Pilgrims came from all Russia to worship and to receive spiritual instruction, advice, and encouragement. The Russians were at the time largely subservient to the neighboring (non-Christian) Tatar (or Tartar) people. Sergius rallied the people behind Prince Dimitri Donskoi, who defeated the Tatars in 1380 and established an independent Russia. Sergius was a gentle man, of winning personality. Stories told of him resemble those of Francis of Assisi, including some that show that animals tended to trust him. He had the ability to inspire in men an intense awareness of the love of God, and a readiness to respond in love and obedience. He remained close to his peasant roots. One contemporary said of him, "He has about him the smell of fir forests." To this day, the effect of his personality on Russian devotion remains considerable. The name of Sergius is as dear to every Russian's heart as that of William Tell to a Swiss, or that of Joan of Arc to a Frenchman. He was born at Rostoff in the early part of the 14th century, and when quite young left the house of his parents, and, together with his brother Stephen, settled himself in the dense forests of Radonege with bears for his companions, suffering from fierce cold in winter, often from famine. The fame of his virtues drew disciples around him. They compelled him to go to Peryaslavla-Zalessky, to receive priestly orders from Athanasius, Bishop of Volhynia, who lived there. Sergius built by his own labor in the midst of the forest a rude church of timber, by the name of the Source of Life, the Ever Blessed Trinity, which has since grown into the greatest, most renowned and wealthy monastery in all Russia--the Troitzka (=Trinity) Abbey, whose destiny has become inseparable from the destinies of the capital. Princes and prelates applied to Sergius not only for advice, but also for teachers trained in his school, who might become in their realms and dioceses the heads of similar institutions, centers whence light and wisdom might shine. Tartar invasion had quenched the religious fervor of the Russians: a new era of zeal opened with the foundation of the Troitzka monastery and the labors of Sergius. At the request of Vladimir, Athanasius, a disciple of Sergius, founded the Visotsky monastery at Serpouchoff; and another of his pupils, Sabbas, laid the foundation of the convent of Svenigorod, while his nephew Theodore laid that of Simonoff in Moscow. In the terrible struggle against the Tartars, the heart of the Grand-Prince Demetrius failed him; how could he break the power of this inexhaustible horde which, like the locusts of the prophet Joel, had the garden of Eden before them and left behind them a desolate wilderness? It was the remonstrance, the prayers of Sergius, that encouraged the Prince to engage in battle with the horde on the fields of the Don. No historical picture or sculpture in Russia is more frequent than that which represents the youthful warrior receiving the benediction of the aged hermit. Two of his monks, Peresvet and Osliab, accompanied the Prince to the field, and fought in coats of mail drawn over their monastic habit; and the battle was begun by the single combat of Peresvet with a gigantic Tartar, champion of the Horde. Now back to the time of Sergius. 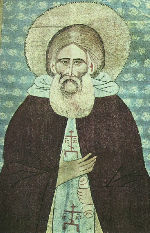 The Metropolitan, Alexis, being eighty-four years old, perceived that his end was approaching, and he wished to give Sergius his blessing and appoint him as his successor. But the humble monk, in great alarm, declared that he could not accept and wear the sacred picture of the Blessed Virgin suspended by gold chains, which the primate had sent him from his own breast on which it had hung. "From my youth up," said he, "I have never possessed or worn gold, and how now can I adorn myself in my old age?" St. Sergius died at an extremely advanced age in 1392, amidst the lamentations of his contemporaries.